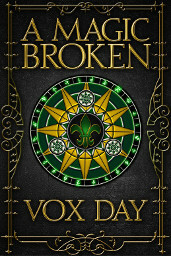 Vox Day’s “A Magic Broken” takes us into the sordid brothels of Selenoth with an entertaining trick of a tale featuring assassinations, castrations, and revelations that most readers can probably plow through in under a half hour. The narrative is split between Lodi the dwarf warrior and Nicolas the battle mage while at cross-purposes in the dwarven built merchant city of Malkan. Much of the suspense is derived from not knowing what exactly they’re after, or why. The big reveal will not come as much of a surprise to those who have read A Throne of Bones, but will help to fill in some of the back-story. The crosscutting between Lodi and Nicolas provides an intriguing tension in the first half, but the threads never quite came together for me (plot-wise, Nicolas’s storyline in the city turns out to be largely irrelevant). There may have been a missed opportunity for them to carry out their operations at the same time. But you can never go wrong with a climactic pyrotechnic wizard battle. As always with Vox, the characters are drawn with care, detail, and humor, whether it’s the brothel madam who thinks our hero is a pervert, or the slave trader with a heart of gold. Their dimension is in the details. For instance, in one scene we are introduced to a passed-out drunken brothel whore in the kind of bar whose patrons aren’t that concerned with obtaining affirmative sexual consent. Later, an old friar tries to wake the girl up, and Nicolas – not one known for his sentimentality – is cheered by this small act of mercy. Quadras Aetias was a tall, lean man with a bald head and a bony face. Everything about his elegant demeanor suggested the banker, not the whoremaster. But was there really a difference, in the end? And like most wealthy cities, Malkan attracted predators of every shape and size. The bankers and the guilds comprised the elite that truly ruled the city. They raised up petty nobles when it served their collective interest and tore them down again when it did not. Perhaps only the orc tribes of the east knew such vicious and violent politics. A man who nominally ruled the city on Starsday might easily be assassinated, eulogized, interned, and all but forgotten by the following Moonday. That mix of opulence and corruption makes Malkan an interesting “wretched hive of scum of villainy” city, and I hope to see it again in the second volume of A Throne of Bones. A Magic Broken is definitely one of the more edgy and amusing of the Selenoth stories, taking a straightforward search-and-rescue plot and placing it into a brothel with dwarves, whores, and bankers. I love this 5 character rule! I may have to do this in my next campaign. That way things don;t fall apart halfway though and less NPCs to have to make. I wish I’d thought of it.